Richard III is among Shakespeare’s earliest and most enduring successes and Richard, Duke of Gloucester and later King of England, perhaps his most thoroughly evil character. Despite the ingratiating manner he can turn off and on at will, Richard’s heart is as ugly and twisted as his body is deformed. Trusting no one, and thinking of nothing but his own gain, he is by turns vicious, conniving, dishonest – and utterly fascinating to audiences since Shakespeare’s colleague Richard Burbage first stepped onto the stage to declaim, "Now is the winter of our discontent/Made glorious summer by this son of York." And that tradition continues unabated at Chicago Shakespeare Theater. 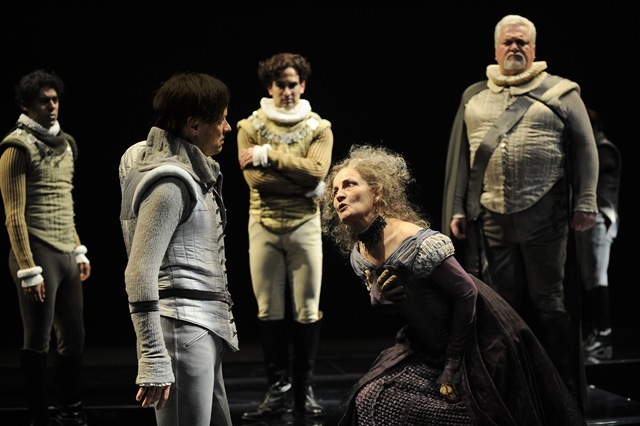 In the capable hands of Artistic Director Barbara Gaines, Richard III once again works its magic of simultaneous attraction and revulsion. 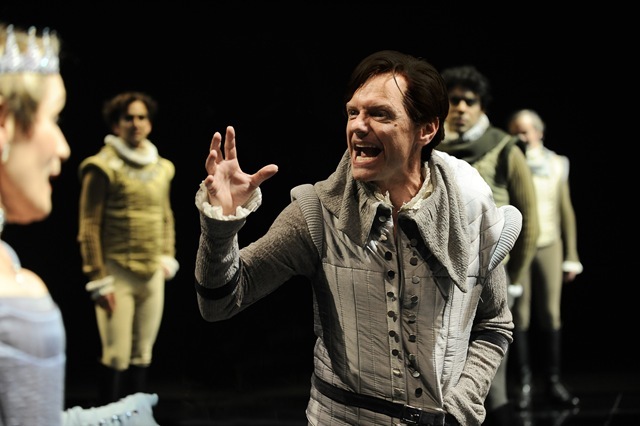 Briskly paced and sensibly edited, this "Richard III" is relentless in its march towards its anti-hero’s tragic, self-inflicted destiny. 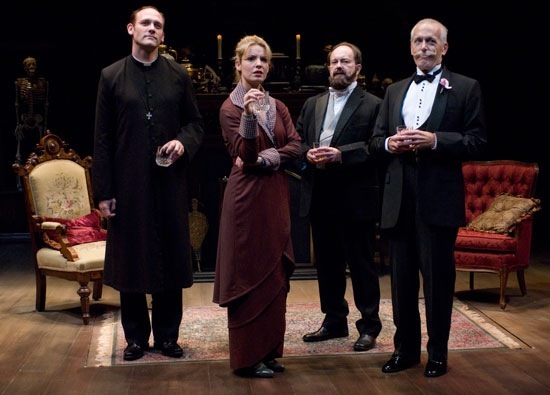 Wallace Acton as the amoral royal of the title brings a surprising amount of humor to his role. His soliloquies and asides to the audience succeed in drawing us in, making us complicit in his mad determination to seize the throne. By the time the culminating battle is approaching, Acton’s Richard has come completely undone, but with a mania and a desperation entirely in keeping with the vicious joker of but a few hours earlier. Other standout performers in the generally strong company include Kevin Gudahl as Richard’s cousin and accomplice, the Duke of Buckingham, John Reeger as the steadfast Lord Stanley and Dan Kenney as Catesby, Richard’s personal enforcer. Brendan Marshall-Rashid brings authority and gravitas to the small but pivotal role of Richmond, the future King Henry VII and founder of the royal House of Tudor after Richard’s death. Interestingly enough, it is the women of this "Richard III" who truly shine – women who give lie to the assumption that politics in the Fifteenth Century must have been a man’s game. Wendy Robie, as Richard’s sister-in-law, Elizabeth Woodville, Queen to the soon-deceased Edward IV, and Mary Ann Thebus as his mother, the Duchess of York, are fine, strong actors and women to be reckoned with; they deal with Richard on their own terms. Angela Ingersoll as Lady Anne Neville brings a delicate intensity to a notoriously difficult role. One can feel her chaotic emotions as she is wooed literally over the dead body of her father-in-law, King Henry VI, by the monster who killed not only that monarch, but Anne’s husband and her father. Ms. Ingersoll makes Anne’s impossible choices seem understandable – not an easy task. Gaines makes terrific use of the sleek, heavily reflective multi-level set clad in plexiglass – designed by Neil Patel and lit beautifully by Robert Wierzel – including inventive use of exits and entrances all through the CST’s auditorium. Special mention needs to be made of Susan E. Mickey‘s brilliant costuming. Evocative of traditional Elizabethan shapes and silhouettes, but executed in muted palettes and of lighter weight fabrics, these are clothes that suggest and reference, without encumbering actors in layers and layers of detail (see video of Ms. Mickey’s perspectives on the visual world of the play here). The director and this designer all star team continue to surprise with images of startling beauty, right up to the closing moments. Richard III may be one of Shakespeare’s most familiar vehicles, but this is a "Richard III" to remember. 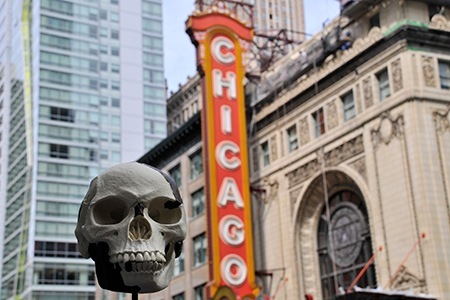 Fake, Steppenwolf’s season opener, written and directed by ensemble member Eric Simonson, explores the well-known scientific hoax "Piltdown Man." Initially thought to be the "missing link" and a confirmation of Darwin’s theory of natural selection, suspicions about Piltdown’s authenticity cropped up almost immediately and continued to fester until, in 1953, with more modern dating techniques, Piltdown Man was conclusively proven to be a fake. The identity of the fossil’s forger has never been conclusively proven, although it is widely believed to be Charles Dawson, Piltdown Man’s "discoverer." Simonson juxtaposes two stories, one set in the years following the fossil’s discovery, and a second at the time the hoax is confirmed. Both are fiction, although the earlier story does involve historical personages Dawson, Charles Woodward, director of the prestigious British Museum, Pierre Teilhard de Chardin, a Jesuit archaeologist of some note, and author and amateur scientist Sir Arthur Conan Doyle. Unfortunately, neither story is terribly compelling, alone or in concert with its twin, despite the larger-than-life presence of Doyle. The more modern tale, involving a romantic triangle between the elder Oxford anthropologist charged with ascertaining the fossil’s true age, a female Lithuanian former student half his age who’s also his fiancé, and a young, go-getter specialist from UCLA, is certainly the weaker of the two – as certain as we are of the outcome of their testing of the Piltdown skull, there’s even less mystery how this ill-fated love story will play out. 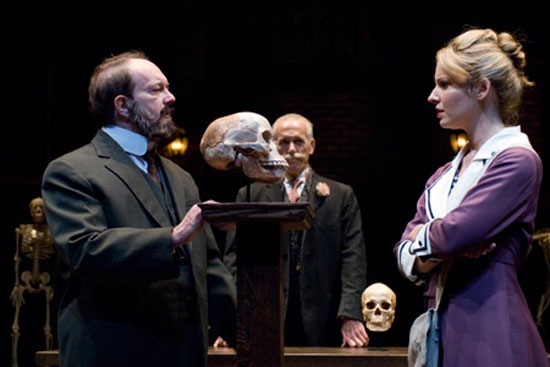 Some of the Steppenwolf ensemble’s better acting talent is at work here, including Francis Guinan as Doyle and the jilted Oxford don, and Kate Arrington, as a Nellie Bly-type "lady reporter" who uncovers Piltdown Man’s creator and the young Lithuanian. 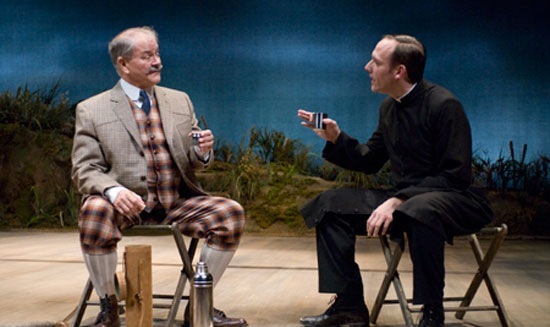 The production’s design, by Todd Rosenthal (scenery), Karin Kopischke (costumes) and Joe Appelt (lighting) is both evocative and pointed. But in the end, it’s the play itself that disappoints. Simonson’s theme of how and why we come to know what we call "the truth," and what role faith plays in arriving at it, is not uninteresting. But the uneven tone and murky philosophizing of Fake render an interesting idea into a somewhat less than satisfying evening in the theater. 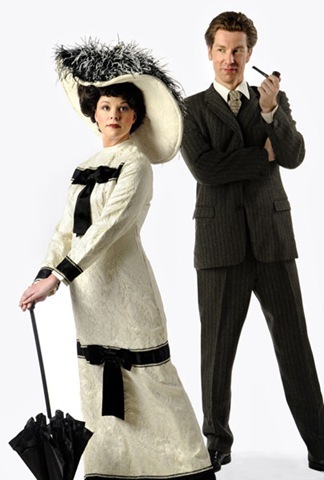 Review: Light Opera Work’s "My Fair Lady"
One of the crown jewels of Broadway’s Golden Age of Musicals, My Fair Lady, from its original Tony Award-winning production, to its best-selling cast album, to its Best Picture-winning film, may well be the best-known and most often produced entry in the musical theatre canon. 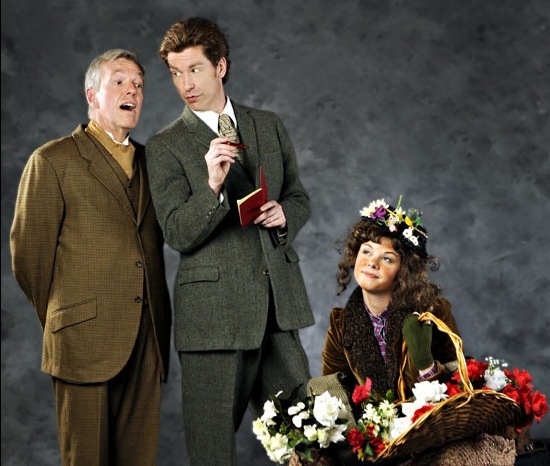 And it has all of the hallmarks of its genre: the gorgeous melodies, the comic show stoppers, the happy ending… Since 1956, everything about My Fair Lady has been inescapable, as warm and familiar as Higgins’ slippers. Which is precisely what Light Opera Works is serving up at Northwestern’s Cahn Auditorium (map) in Evanston. From the musical phrasing to the Cecil Beaton Ascot costumes, everything is as we remember it. There are no surprises – good or bad – and whether you consider that a blessing or a curse will determine how you respond to this My Fair Lady. The performers have without exception strong voices and portray convincing enough characters, within the somewhat tradition-bound scope of their roles. Natalie Ford‘s Eliza is, by turns, plucky, elegant, and determined, and her “I Could Have Danced All Night” was, as it usually is, a tour de force. 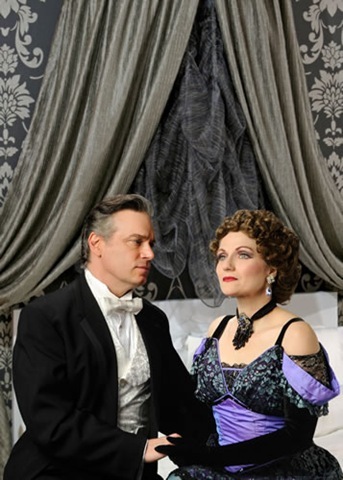 Cary Lovett, as Liza’s father Alfred, and Jeff MacMullen, as erstwhile suitor Freddy, deliver their equally-well-known music hall-style and pining young lover turns with all requisite charm – and, in Mr. MacMullen’s case, with a soaring tenor voice that breathes real life into “On the Street Where You Live.” In a smaller, non-singing role, Jo Ann Minds brings a brittle wit to her portrayal of Higgins’ mother that would make Dame Judi Dench quite proud. Nick Sandys, as Professor Henry Higgins, is bit less successful – if by “success” we mean simply delivering a fascimile of what we’ve seen before. Sandys is younger – significantly younger, it would appear – than Rex Harrison in this part. His aristocratic good looks make Eliza’s attraction to him much easier to see, and throw his relationship with his mother into much sharper focus. Sandys is quicker, and brighter, as Higgins, his mind always at work; it is easy to understand this Professor not seeing the love blooming before his very eyes. In the end, as the chorus of “I Could Have Danced All Night” swells through the full orchestra’s strings, and Liza goes to fetch Higgins’ slippers, we get from this My Fair Lady exactly what Light Opera Works promised. If you’re in the mood for a faithful recreation of a familiar musical classic, My Fair Lady will be performed through August 30th. 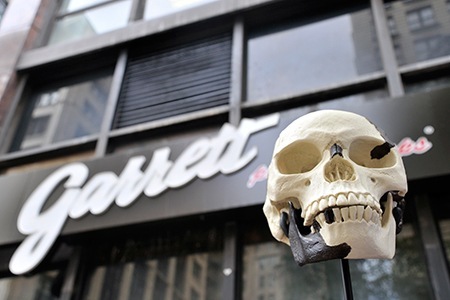 Read more about the show after the fold. 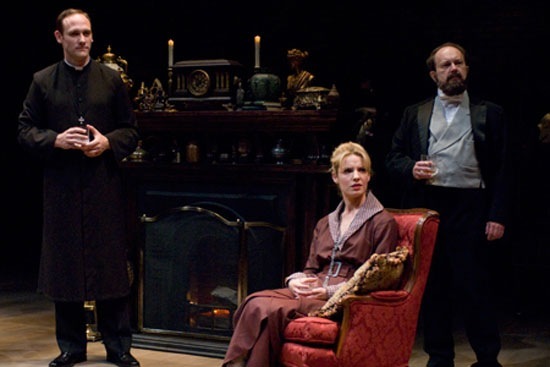 Stephen Sondheim‘s A Little Night Music stands almost alone in the grand sweep of his works for musical theatre – though set in the perpetual twilight of a Scandinavian summer night, A Little Night Music is perhaps his lightest show. Far better known for “the shadows where, artistically at least, he has always felt most at home,” in the words of NY Times critic Ben Brantley, Sondheim here takes a less tragic, more bemused view of love and its foibles. Although ..Night Music starts with pairs of lovers – some mismatched, some not remembering why they matched in the first place – the romantic, waltz-based score leaves little doubt that come the night’s final turn about the ballroom floor, love will right all wrongs. 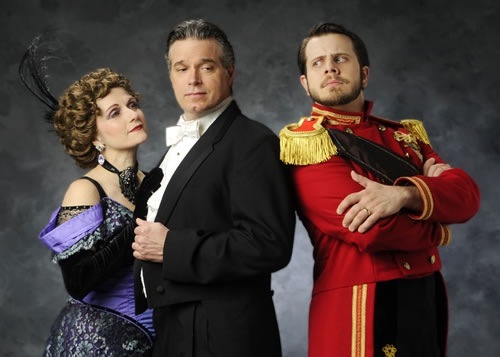 Seldom seen outside of opera houses due to the breadth and complexity of its score, A Little Night Music is now revived by Light Opera Works in Evanston through June 14. 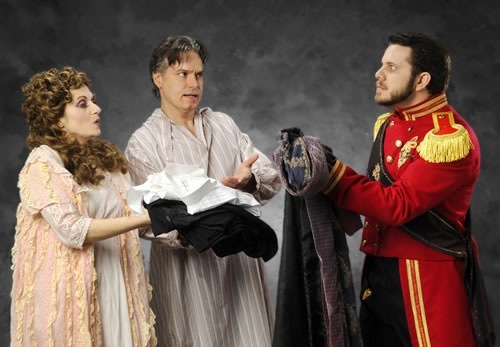 As audiences have come to expect from Light Opera Works, the quality of the production’s music make this a production well worth seeing. It is a delight to hear Jonathan Tunick‘s orchestration of some of Sondheim’s most memorable songs given a treatment at once lush and precise (through a 28-piece orchestra), under the baton of music director and conductor, Roger L. Bingaman. The demands of the vocal score, with its intricate harmonies and counterpoints, are a challenge to which this cast seem generally well-suited. Almost without exception, the principals give strong, musically solid performances. The trio of “Soon,” “Now,” and “Later,” sung by Natalie Ford, Larry Adams, and Mike Reckling, the “Liasisons” of Judy Golman, and the quintet that act as a Greek chorus throughout were uniformly well-sung. Catherine Lord, as the actress Desiree Armfeldt, delivers the show’s “hit” song, “Send in the Clowns,” with subtlety and a heartbreaking, self-knowing regret. A singer cast in a role written for a non-singer, Miss Lord has vocal power to spare in delivering a “Send in the Clowns” you will not soon forget. Only Jessye Wright, as the Countess Malcolm, and Megan Long, as the maid, Petra, fail to deliver in their solo turns. Although Miss Wright has some of the biting, self-deprecating wit her role requires, she unfortunately has been cast in a role unsuited to her singing voice, and she struggles to change registers in “Every Day a Little Death.” Miss Long’s “The Miller’s Son” is undermined by her brassy voice but perhaps more so by a tempo much slower than one would expect and some jarringly suggestive moves that conspired to render her number, always problematic in the flow of A Little Night Music’s book, a mood-deflecting speedbump so close to the denouement. But these are minor faults in an evening in which one can experience the thrill of hearing a full chorus and orchestra set off on such an incredibly joyous “Weekend in the Country.” Mr. Sondheim may prefer the shadows, but his foray into the Scandinavian twilight remains a romantic masterpiece, and it is delivered by Light Opera Works with the loving musical care it deserves.